Lawrence Academy will open the 2019-20 school year with a new 75-minute long block schedule. The school will continue to have seven (A-G) blocks which will allow maximum flexibility for students taking required and elective courses and also provide every student with a free block. The blocks will rotate over a two-week time period, creating alternating Red and Blue week schedules. Classes will meet every other day. Blocks will have the same number of total class meetings per term. This change reduces net teaching time per week by 12.5 minutes. The current block schedule, alternating shorter blocks with a longer block, has been in place with only slight tweaks the last eight years. Moving to a schedule that offers the consistency of 75-minutes blocks helps create a regular rhythm from which we will all benefit. 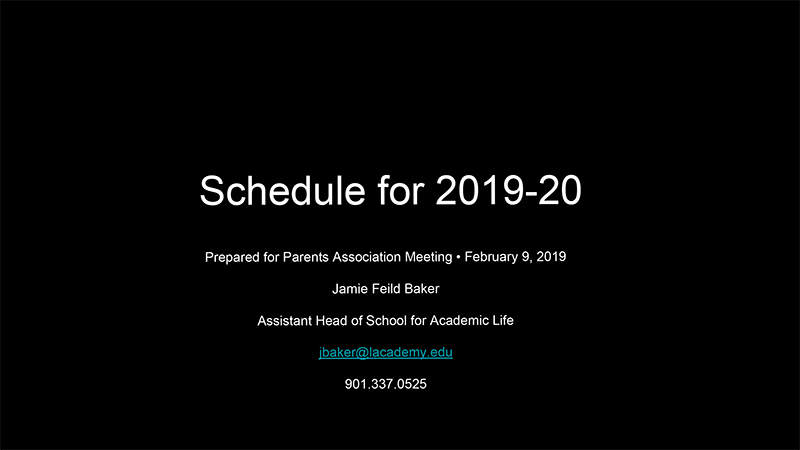 Click the "Schedule" image to peruse the slide presentation given to parents at the LAPA Meeting, Feb. 9, 2019. To best serve students and their learning, we have known for a few years that we needed to develop a schedule that reflected our foundational beliefs about learning, students, and what good preparation looks like for a vastly different world than what most of us adults grew up in. In addition, doing what we can to address student stress and anxiety is always top of mind. The new 75-minute long block schedule offers routine, predictability, a relaxed pace, extended learning time, increased homework time, and malleability — all needs the current 45-minute rotating block schedule fails to meet. In developing the new academic block schedule, the faculty held dozens of conversations over the last few years about the use of time at LA. Much thought was given to the non-negotiable needs like daily advisory/assembly, hard limits like the start and end time of each day or PSAT day, as well as the reality that every year we host a myriad of speakers, assemblies and Independent School League obligations that we have to accommodate. Faculty pondered extensively questions regarding how to structure time to support our strategic priorities of exceptional faculty-student connections, a compassionate culture, and individualized teaching and learning for all students. We believe 2019-20 schedule creates for adults and students a better platform for us to lean into and build toward these strategic priorities. Faculty and students tried out a similar long block schedule in the spring of 2018 and are excited about the new 2019-20 schedule. Many have openly wondered why we have to wait until fall to make the change. What are the main features of the 75-minute long block schedule? 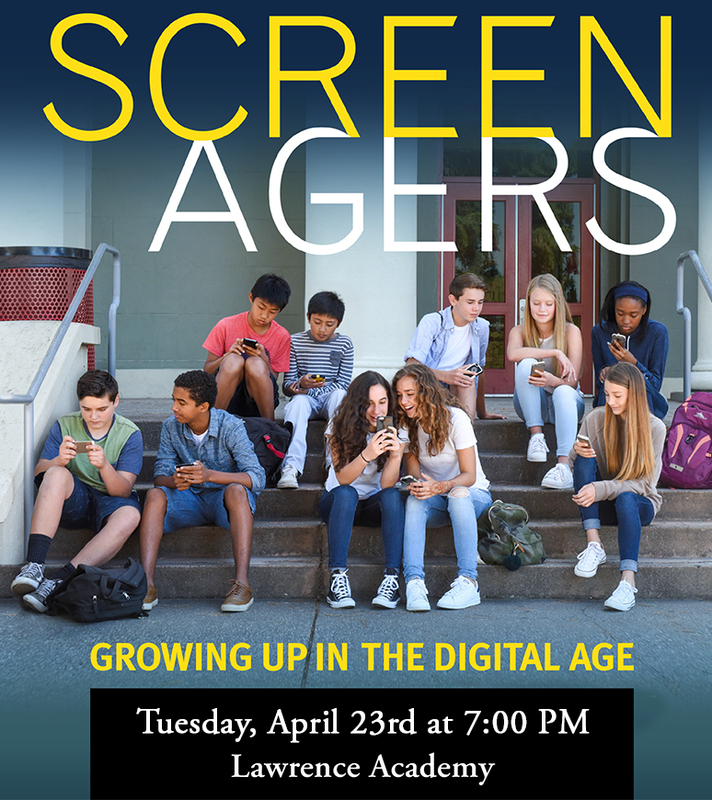 How will students manage to sit still for 75 minutes? The short answer is that students will not have a chance to sit still for 75 minutes. Research on attention concludes that average adult’s attention wanes after 18 minutes of new information. It is not an accident that TED talks are limited to 18 minutes in length. For children, the rule of thumb is sustained attention expectations should match their age. Teachers should change classroom activities every 15 to 20 minutes. A good classroom sequence in 15-minute increments would be anticipatory set or warm-up activity, direct instruction, application, assessment, reflection. How will the longer blocks benefit learning? Our new schedule is intentionally organized to create longer classes so that students can learn, apply, receive feedback, iterate, and reflect on information within the same class period. Having more time to work with information in a variety of modalities will make it easier for students to transfer what they are learning from working memory to long-term memory. Because of this, their learning becomes more “sticky” and accessible over time. Students will have more in-class time to collaborate in small groups and teachers will have more opportunity to gauge how each student is thinking and understanding information. Teachers will also be on hand to see students work problems or apply information which means they can offer feedback and redirection in real time before a student solidifies processes wrongly or becomes frustrated or stuck. What assumptions and automatic beliefs must we set aside to fully embrace the new schedule? We must come to a shared understanding that teaching today is not about the transmission of information from one generation to the next. Each of us carries in our pockets a computer more powerful than the mainframe used to send Apollo 11 to the moon. So, teaching shifts to a focus on designing and leading opportunities for students to validate, synthesize, and apply information. It is through learning by doing that students develop understanding. We must also realize that students can successfully engage in learning outside the presence of the teacher. It becomes the responsibility of the teacher to design meaningful, learning-oriented homework that extends classroom learning. This causes us to give up the idea that seat time drives learning results. What is being done to prepare faculty and students to be successful in this new schedule? Long blocks are not entirely new to LA faculty and students. Each discipline currently has one 70-minute block per week. To prepare for the new schedule faculty are learning about various sequences of learning activities that are possible in each block. They are also engaging in professional learning designed to help every teacher increase their toolbox of strategies for all activities like whole group instruction, assessing prior knowledge, review, small group work, guided practice, assessments, homework, etc. In addition, we are in the process of reviewing and discussing all academic policies in order to amend them to match well with the new schedule. Which subjects are most easily adapted to 75-minute classes and which might struggle with the adjustment? Because all of our disciplines currently offer a 70-minute class each week, everyone should adapt to the new schedule without difficulty. Will the new schedule reduce the number of special schedules? Yes. While there will be adjustments that must be made to the daily schedule from time to time, we have the opportunity to take out non-teaching time in order to make room for assemblies, speakers, or shortened days. We believe that we will be able to anticipate many of the special scheduling needs that are routine from year to year and plan accordingly so that teaching time is highly protected. How will the new schedule affect student workload? In the new schedule, students will be preparing for fewer classes each day. We expect they will work more attentively in each subject area, therefore, their workload should stay the same, it will just be differently distributed. How will Office Hours work? Each teacher will choose a regular location in which to hold Office Hours. He or she will be expected to be in that location during Office Hours so that students can easily find them. Will help be available at times other than Office Hours? Yes, help will be available at times other than Office Hours. We do, however, expect that students will try to meet with teachers during Office Hours first but understand that other situations will arise. In addition, the Academic Help Center will remain open during study hours each night. Do other schools use this type of schedule? Yes, the long block schedule has been a common practice in schools since the late 90s. Will the new schedule affect the bus schedule? No, the bus schedule will remain the same. What will the schedule look like on half days or delayed openings? Because classes happen at the same time each day and there are non-academic blocks that occur each day, we should be able to formulate half day and delayed opening schedule in a fashion that teaching time is not sacrificed. How will students get missing work if they are absent, but don’t have class the next day? As is our current practice, assignments will be posted online at the end of each academic day. Students will be responsible for learning what their assignments are and having work ready for the next class meeting. How will the new schedule affect assessments? The new schedule will remove time constraints that currently put pressure on or cut short the types of assessments we use. With more time in each class meeting, teachers will be able to make fuller use of learning assessments that do not easily fit in a shorter class meeting like whole class presentations, simulations, in-class performance or production or work. Of course, we currently use all of these types of assessments. The new schedule will make them easier to plan and implement. There will also be time in the longer blocks to review material in class before testing or to take a test then go over each problem or question together while the material is fresh in students’ minds. How will the success of this new schedule be measured? Success in the new schedule will be largely self-evident. Students and faculty will report being less rushed and fragmented in each day. Teachers will discover that they have more opportunity to use a variety of learning activities and students will be more engaged in class and in their own learning. If we had a good year over year data, we would be able to compare things like check-ins to the health center and tardies to each class, but the baseline data is not in good shape.